New York Fashion Week, the semi-annual crème de la crème of style and taste, will be kicking off this February. For residents of the luxurious apartments in Manhattan, this is an opportunity to see the grand works of the world’s most notable designers, up-close-and-personal as their models hit the runway at Spring Studios on Varick Street. Fashion aficionados don’t need to be told how big a deal this event is, but they might be looking for some insights on what will be going down at this February’s showings, which is where we come into play. Read on, as we break down the sights and wonders of this highly exclusive display. First things first, let’s tackle some of the general details about the show. According oth NYFW press release from early January, the show will take place over the week of February 8-14, 2018. The bulk of the shows will be held at Spring Studios, and a few additional shows will be held at Industria. It’s important to note that those dates apply to the women’s portion of the show, and the Men’s Fashion Week events will take place from February 5-8. You can get a better idea of the schedule and projected calendar of events by checking out the Fashion Week Online calendar here. The list of shows is long, and will include designs from Dion Lee, Gemma Hoi, Noon by Noor and more. 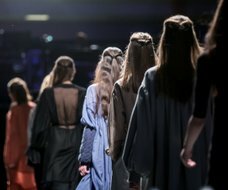 You can see the official designer listing here, and stay abreast on all the official New York Fashion Week information by keeping your eyes on NYFW.com along with @NYFW on Instagram, Facebook, and Twitter. Wang’s move seems to hold a lot of sway as well, since there are a number of so-called “younger brands” intrigued by the idea and contemplating giving it a try. Then there are other designers who will be staying in New York for February but adopting their own “off-brand” approaches, away from the main runway. Victoria Beckham, for instance, will be hosting “mini shows at the James Burden Mansion on the Upper East Side” instead of tackling the main event, but will be back on the runway when London rolls around in September. A quote from Rose, brings up an interesting point: “As our brand is evolving, we felt the need to connect with consumers in a different way,” she told Vogue. Perhaps this is applicable, in some ways, to the fashion world as well? Could it be that shows like New York Fashion Week are now at a point where they’ll have to adapt the way they go about things, lest they face irrelevance? And of course, let’s not forget some of the underdog stories of New York Fashion Week, like that of Sandra Sandor, detailed in The New York Times. She and her boyfriend, Peter Baldaszti, have been designing for their Budapest-based label Nanushka for 13 years, but will be showing their wares at NYFW for the first time this year. It will be interesting to see how NYFW shapes up for Nanushka, as well as the other big-time brands that will be in attendance. Places like Renoir House, one of the Upper East Side’s most elegant rental communities. Here, residents enjoy the pristine location, spacious floorplans, and superior building features, all of which contribute to a level of Manhattan luxury most only dream of.